We were fascinated when we watched the origami mushroom that was shown during Oregon Public Broadcasting's recent fund raising program on origami, Between the Folds. How whimsical! In the next few days we tried our hand at a couple of mushroom origami, thanks to the help of some Internet sites. We're attaching links to several of our favorite sites below. They're great starting points for creating your own origami mushrooms. 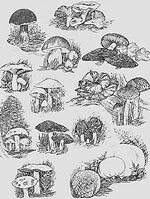 And, let's face it: until spring brings us verpa and morels, perhaps this is as close as we'll get to mushrooming! 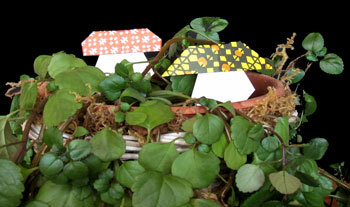 in the "Creeping Charlie" - origami mushrooms! We couldn't resist trying Fine Cooking's August/September 2010 recipe for Sesame Steak Salad with Asian Pears. It sounded like a real gem, combining our favorite flavors with the crispness of the Asian Pears. It didn't disappoint, and we've returned to this lovely dish several times substituting Bosc Pears when the Asian Pears are scarce. And, yes, I am sure that it will come as no surprise that we like to add a handful of shitake mushrooms to the dish! It looks like there's company in the front yard!